When the thought of getting an app for the business is considered, what concerns them the most is, the confusion regarding the mobile app development approach. To choose between the native and the hybrid can be a tough decision, but surely not impossible. In this blog, we will help you to choose the best one, but before making any decision, it is important to know about the native and the hybrid apps. So, let us first explore a little about the native and the hybrid apps. The native mobile app is a smartphone program that has been created for a use with a particular platform or devices like for iOS and Android. They are encoded in a particular programming language such as Objective C for iOS and Java for Android operating systems, and they are installed from an application store and show up on the device as the icons. These apps utilize the device features such as camera, contact list, GPS etc. Thus, the native apps typically are better in performance than the hybrid apps. So which One You Should Choose For Your Business? In order to make the right choice, you need to consider the advantages and the disadvantages of both the native and the hybrid apps. 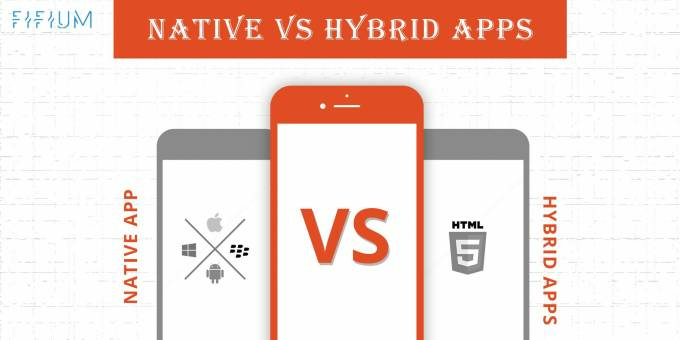 To help you in deciding whether to choose native or hybrid app development approach, let’s have a look advantages and the disadvantages of the native mobile app and the hybrid mobile app. Since the apps are built utilizing the native platform interface components, they appear as natural extensions of the platform, which provides a visually seamless user experience. The UI guidelines also include conventions regarding app behavior, ultimately making the user’s interaction easy and smooth. The native apps have full access to the platform APIs, they also have direct access to all platform-specific capabilities including the embedded hardware, peripherals, and UI components. Therefore, they can use the smartphone’s features like the USB, GPS, and cameras etc. The native applications that are written with platform-standard languages and toolkits, achieve the highest possible runtime performance. These applications are highly efficient and they perform very well. Developing a native app involves additional work and time, as you will need to hire additional developers for the work, and also you need to make sure that they possess the abilities that are required for developing apps for various operating systems. Not only the above-mentioned benefits, but the native apps have a lot more to offer, such as it boosts user security and safety, it has simplified distribution and ease of monetization, better UX, enriches user functionality, and much more. The hybrid apps usually reduce the need of too many app developers. Therefore, by developing the hybrid apps, the companies can save money. The hybrid apps add an extra layer between the source code and the target mobile platform, resulting in the loss of performance. People prefer the apps with the best performances and the hybrid apps are not the people’s preference. The extra layer between the source code and the target mobile platform also makes debugging a potential nightmare. The developers have to depend on the framework itself to play perfectly with the targeted operating system. Since the developers may not possess a deep knowledge of the platform, figuring out the exact cause of an issue can be a lengthy task. The businesses are probably going to experience difficulties trying to achieve the goals of latest features with the hybrid frameworks. As you can clearly see that the disadvantages of the hybrid apps dominate its advantages. Therefore, hybrid apps are not the right choice for the businesses. It is a known fact that the hybrid apps don’t perform as well as native as, so if you are thinking to choose a hybrid approach, make sure you are aware that your users’ experiences will likely suffer. On the other hand, a native approach offers numerous advantages, proving it a right choice. Each approach has its pros and cons, but at the end of the day, a native approach will have the biggest benefits for a company’s bottom line. To get a native mobile app developed, get in touch with FIFIUM a mobile app development company in Denmark that caters the best app solutions as per the business requirements. We take pride in serving our clients in the best possible way and creating memorable experiences for them. At FIFIUM, we create apps that people love. Therefore, feel free to contact us anytime and we will love to serve you.